The point I am trying to make is to ask questions when purchasing solids.... make sure to ask if the perfume, label and box are original!!! Am not sure if you're referring to one or 2 sellers. You said this person who contacted you has "empty compacts" with no magnets. (Not much of a compact, hey?) Then you questioned whether or not the compact is empty. Regardless, I agree that sellers should disclose whether or not the solids they are selling are from their own Personal Collection...or previously purchased on eBay...or "found" at a flea market in deplorable condition. Several of us are currently selling a few solids from our own personal collections and I just "assumed" they were all "Original." If it's someone I've known, whether from this site or in person, and they said it was all Original, I'd have no reason not to believe them. However, you're right...it never hurts to ask. It really bothers me that now I have to worry about magnets...who would have thought? Edited by zooey, 08 March 2011 - 12:07 PM. Something else to add to the list! Will it never end! Some people out there are desperate but at least we are keeping ahead. We should make a CHECK LIST for all new collectors so that they are armed to the teeth when purchasing out in the wilderness! Hopefully there are not too many Scammers so we can keep abreast of them......so say we all! Edited by Ar, 10 March 2011 - 12:36 AM. Well fortunately for us 'oldies' we know who, what and where! As for the newbies, they should contact any of the old collectors if they are unsure. Otherwise they could be throwing their money down the drain....... As long as they do not contact a seller who is not A1........Oh dear! Oh the cloak and dagger world of solids. You guys are really getting me scared to buy anything now! Except from you, Lisa, and thanks for the good advice. That's a helpful list, Petals! I have started asking alot more questions since I first started collecting nearly a year ago. There's still so many more compacts I would like! First, I'd like to thank AR for originally posting the list of things to look for. Secondly, I'd like to mention that buyers (including members here) should ask questions of ANY and ALL sellers they're working with. Anyone who is selling off empty solids with no labels, OR solids with incorrect labels, OR solids with perfume that is sort of "off"...but who has a relatively good reputation, well, just be careful. No one is exempt from the occasional trickery that goes on. Please...always do your research. Always ask questions. Edited by zooey, 26 March 2011 - 12:11 PM. sorry to contradict your post, but the Butterfly was isssued in 1993 as with Beautiful perfume as with White Linen perfume and in 1994 in Europe with White Linen perfume. Unfortunately I don't own the outer, white box or sleeve for the Beautiful one. If someone has it, please send me a pic of it or sell it to me.....thanks. Edited by Brigitte, 26 March 2011 - 08:55 AM. Strange question, but do you have listings of all of the box bar codes? I have a cameo box that I displayed the cameo and several of them fit in the box, so I can't remember which belongs in it? LOL! This is also a note to remind myself not to do this again!! Thank you for being such a wonderful wealth of info! Hi Brigitte - No need to apologize! You're only adding to the information. So, what you're saying is there were two different fragrances issued in 1993 in the Blue and Purple Butterfly, yes? Mine, with the Beautiful Solid Perfume, has a bar code of 0 27131 04681 3. The one I own was made in the U.S.A. as stated on the box. Mine does not include the White Outer Box...only the original Gold Box. 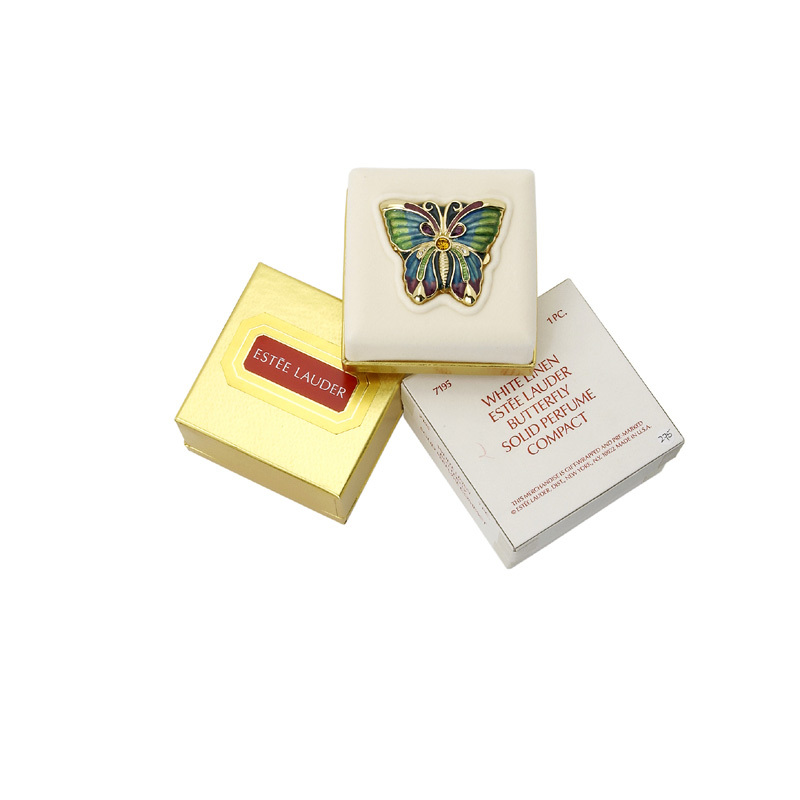 Can you tell me if the bar code on your Beautiful Butterfly Gold Box ends in a 1 or a 3? That would possibly indicate the country of origin, with 3 being the US. Or...the difference between the last number of the Bar Code could also designate the country it's distributed in. I see in the upper left corner of your 1993 White Linen White Outer Box there is a four digit number of 7195. On the back of my Gold Box with the 1993 Beautiful perfume, the four digit number is 4395. Does this match your Gold "Beautiful" Butterfly box? Does anyone know if there was a White Linen Butterfly issued in the US in 1993, or just the Beautiful Butterfly? Again, no need to apologize. You're not contradicting me...just adding to the wealth of information on solids. Isn't it amazing!!! The plot thickens..... Whew! I need a large glass of Bailey's! Hi Butterflies - The same thing happened to me. One of the little round labels fell off while I was dusting a glass shelf. Like an idiot, I proceeded to vacuum it up. No, it doesn't necessarily mean the label is not original. Possibly the label dried out over time and separated from the solid case. I hope you didn't vacuum it up as I did. Edited by zooey, 26 March 2011 - 01:21 AM.